One of the most difficult seasons in life can be when it comes time to care for an elderly parent or relative. Many people between their 40s and 50s are faced with taking care of their own children while making decisions about care for their parents. These people in the sandwich generation are still working themselves and often find it difficult to manage the needs of two households. Fortunately for the residents of Thurston County, FirstLight Home Care is available to provide award-winning care and assistance to local families. FirstLight Home Care is fully equipped to aid families with everything from light housekeeping and meal preparation to full-time care for an elderly or infirmed client. Having a trained caregiver come into the home and assist with meals and help with bathing can mean that people are able to stay safely in their own homes where they feel most comfortable. When choosing outside care for a family member it is important to make an informed choice. At FirstLight Home Care, every employee is a licensed caregiver so that families can feel confident that if their caregiver is sick or unavailable, they will always receive quality, skilled care. 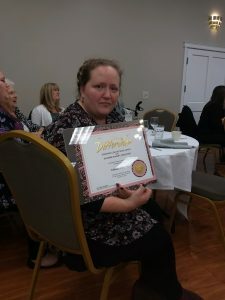 Recently the Senior Action Network held their 18th Annual Caregiver Recognition Dinner and for the second year in a row, FirstLight Home Care received multiple awards. Four caregivers were recognized for excellence in home-based care and three of these won in their category. The caregivers are nominated by the community, in most cases by the client themselves. One of the caregivers was nominated by a third-party who had witnessed the caregiver and her client on several occasions in her home. 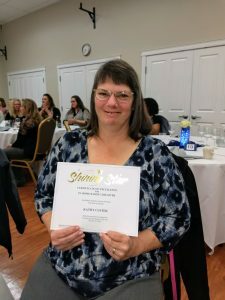 She was so impressed by how respectful and kind the caregiver was that she not only nominated her for the award, she came to the dinner held at South Sound Manor. 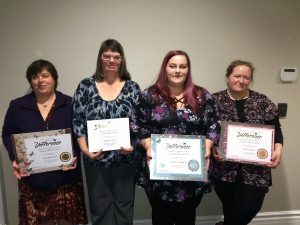 The caregiver recognition dinner recognizes excellent caregivers in the categories of In-Home based, Facility, Family/Volunteer, and Adult Family home care. FirstLight Home Care had the most winners in the category of In-Home based care. Ashley Aulabaugh was nominated as an outstanding caregiver twice! Ashley is a great caregiver that brings her bubbly personality to her job each day. “She is always willing to do anything I might ask,” says one of her clients. “She is always on time, and very nice to be around. She makes me feel better when I’m down and she is always happy.” In addition to making friends easily with clients, Ashley is also described as being well equipped to handle emergencies and difficult situations. FirstLight Home Care owner Sarah Lane says that Ashley is able to anticipate her clients’ needs without them having to ask. 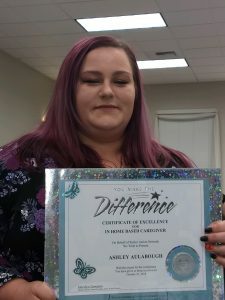 “Ashley’s willingness to provide the best care possible is something we see as her employer,” says Sarah, “but has also been noticed by the community when she recently set up and accompanied her client on a tour of a new facility.” Ashley impacts all she cares for by being friendly and dependable. Emmeli McGee was nominated as an outstanding caregiver by Cheryl, the wife of her client who feels that Emmelihas a gift for caregiving. “My husband has been diagnosed with Parkinson’s Disease and Dementia and Emmeli doesn’t think twice about going the extra mile,” shares Cheryl. When Cheryl needed to travel out of state to attend the wedding of her daughter, Emmelicared for her husband and reassured him that all would be taken care of during his wife’s absence. “Over the few days of my trip, Emmeli cared for my husband, our cat and our home with an emphasis on my husband’s physical and emotional comfort,” says Cheryl. “His routine was uninterrupted due to Emmeli’s expert care.” Emmeliimpacts the lives of others by being respectful, compassionate and dedicated. Frannie Reed was nominated as an outstanding caregiver by Daryl. Frannie has cared for Daryl’s father about a year. “As my father’s condition deteriorated, Frannie was always there to help,” explains Dayrl. When his father could no longer cook meals for himself, Frannie would grocery shop and prepare meals for him, which she would leave at his house each week in ready to eat microwaveable dishes. “It was difficult for me to bring him food from Seattle and I was relieved to know that my father had several nicely prepared meals, even on the days she wasn’t scheduled to see him,” says Daryl. Because of Frannie’s dedication, Daryl’s father has been able to stay in his own home. Frannie impacts those she cares for by being resourceful, reliable and dedicated. Kathy Custer was nominated by her client. He was grateful to have the opportunity to recognize the contributions that Kathy has made to his life. “Kathy’s companionship is a major factor in my daily life,” he says. “She not only cares for my daily needs, but her warm presence fulfills my life, which brings me so much more than just the care she gives.” He describes Kathy as concerned, conscientious and capable. FirstLight Home Care applauds the Senior Action Network for recognizing these special caregivers in the community. Visit the FirstLight Home care website for more information on how they can help your family.